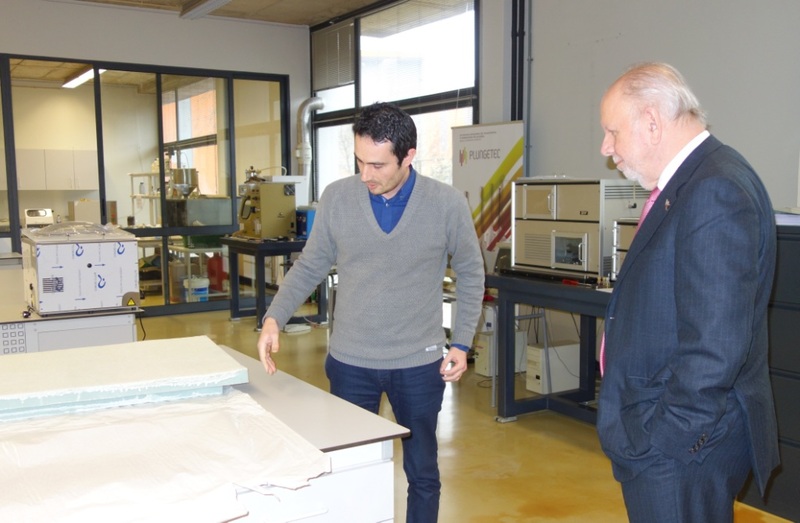 A staff in one of the research labs at the Instituto Pedro Nunes (IPN) explains a newly-developed material for insulation to Philippine Ambassador to Portugal Philippe Lhuillier during a tour at the IPN facility last 12 February 2014. Philippine Ambassador to Portugal Philippe Lhuillier visited the Instituto Pedro Nunes (IPN) located in Coimbra on 12 February 2014. The Ambassador was warmly received by Professor Teresa Mendes, President of the Board of IPN who gave a short overview of the operations of the IPN. Founded in 1991 as an initiative by the University of Coimbra, the IPN is a non-profit private institution dedicated to innovation and development of science and technology for the benefit of the public. The Institute promotes transfer of technology and interface between the scientific and technological system and the production sector. In her briefing, Prof. Mendes explained that the IPN aims to contribute to the transformation of the business environment by promoting a culture of innovation, quality, rigor and entrepreneurship, built on solid relationship between the research and the business sector. The IPN also provides consultancy and specialized services for business organizations especially spin-off companies.